Sheet Pan Dinners like this Maple Roasted Chicken with Sweet Potatoes will become a family favorite. One pan meals are so easy and the clean up is a breeze! Click here to pin this Maple Roasted Chicken and Sweet Potatoes now! Sheet Pan Dinners are so Easy! It’s hard to work all day and have energy to make a tasty dinner. I know. That’s why I am always searching for really, really simple recipes that I can make when I’m tired, and frustrated, and tired, and fed up with the world. Well, I hit the jackpot with this recipe. It has few ingredients, it’s really simple, and once you get it in the oven you can lay on the couch, prop your feet up, and read a good book. Or you know, you could clean up the house and do some laundry. Whatever. You probably also want to file away these other one pan dinners, because everyone needs more book reading time. This Roasted Mah Mahi with Green Beans and Cherry Tomatoes is another sheet pan dinner. Pork Chops with Bacon and Cabbage is not a sheet pan dinner, but it’s all done in a roasting pan, and …. hello …. pork chops AND bacon! We could eat this easy sheet pan dinner every week, we love it that much. Mr. Sidewalk Shoes loves how good it tastes and I love how delicious it is and how easy it is!! You just place the vegetables and chicken on a baking sheet (I line with parchment paper for even easier clean up) toss with olive oil and salt and pepper. Drizzle with maple syrup and top with thyme sprigs. Then roast! You can stir the sweet potatoes and onions at the half way point, but honestly, sometimes I do and sometimes I don’t. If you are looking for more sheet pan inspiration, how about Sheet Pan Suppers: 120 Recipes for Simple, Surprising, Hands-Off Meals Straight from the Oven or Sheet Pan Suppers Meatless: 100 Surprising Vegetarian Meals Straight from the Oven. 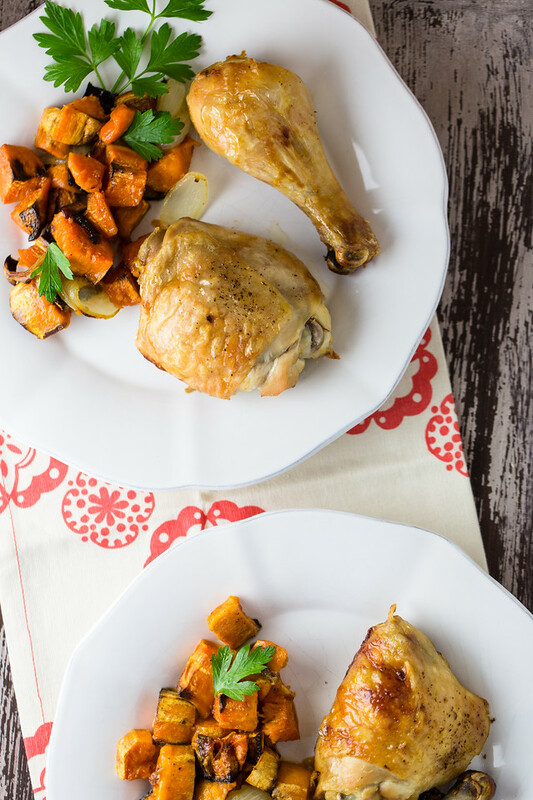 This Sheet Pan Maple Roasted Chicken with Sweet Potatoes is kid friendly and oh so easy! Line a baking sheet with parchment paper, if desired. Place chicken, sweet potatoes, and onions on baking sheet. Drizzle with olive oil and salt and pepper and toss to combine. Drizzle with the maple syrup and top with the thyme sprigs. Roast for 30-35 minutes or until chicken is cooked to 165 degrees, stirring once halfway through. This recipe calls for 4 legs and 4 thighs. You can use all legs or all thighs. Click here to pin this Maple Roasted Sweet Potatoes now! 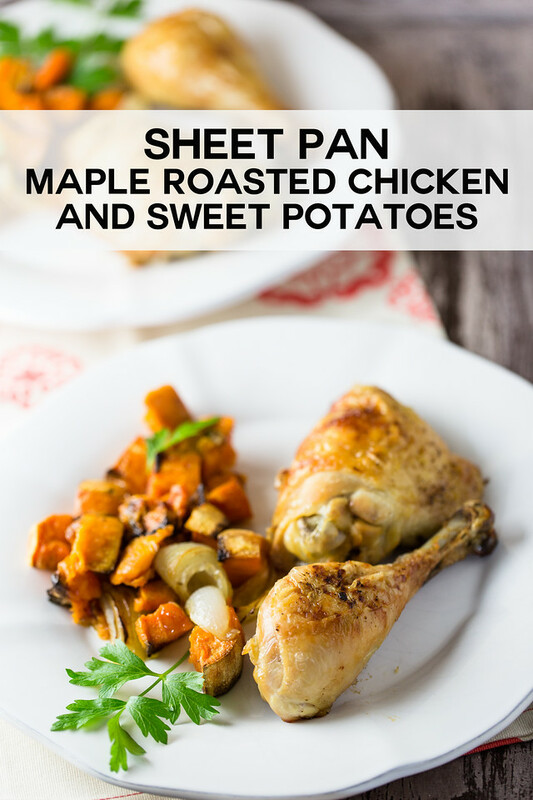 I love this sheet pan dinner, it is perfect for fall! Thanks so much for sharing with us at Full Plate Thursday, we sure enjoyed your post! THis sounds so good… and easy! Pinned. What a great idea- Maple on chicken. It sounds as good as it looks. I would be so honored if you would share it (and some of your other recipes too) at our What’s for Dinner party! Thank you! I don’t have any Sunday link ups so your party sounds perfect! I am a big fan of sheet pan dinners and the ingredients in this one are getting me in the mood for fall! Love it! I know! It’s a fall dish that doesn’t scream fall, perfect for this in between time! Love this recipe!!! Sheet pan meals are so simple and perfect! Perfect for a busy night! I’ve been so happy this last week that the weather has cooled a bit and we can roast again. I’m a big fan of roast chicken and this sounds a tasty, easy way to make a meal of it. We are a bit cooler too! I love sheet pan dinners! So easy to make and clean up! This looks like an amazing combination of flavors! My Canadian husband, who is addicted to maple syrup, will love this recipe! It looks nice! I gotta try out this during this weekend! I really like the sound of a maple roasted chicken. The maple syrup goes really well with sweet potatoes as well. Cali – there are lots of schools of thought on roasting a whole chicken, some like high heat, some like low heat. Red – I would just use how many you think your family would eat. I made enough chicken for 4 servings, so two biggish sweet potatoes would work. I would also then maybe double the glaze. Peter – is this a Canadian dish? I should move to Canada! Natashya – yep, carbs and books, it’s a good combination. Mike – it really is so easy. Marjie – you’d have to make a bunch of sweet potatoes to feed your crew. Pam – You should really try it! Joy – let me know if you try it. Terri – what’s in the horseradish cream sauce? Cali – I’m so glad you liked it! Granny – it’s a coarse salt. Grace – no fuss is the way to go! I love your recipes, and have made a few … but what in heavens name is Kosher Salt ? This Brit has never heard of it ! I tried this last night as I had some sweet potatoes ready for service. This meal is delicious! I give it five *Swimmies*. Thanks! Note: solved the “hate to cut up raw chicken” and my preference for white meat dilemma by using chicken breasts. This sounds heavenly. I am in love with sweet potatoes right now… especially as “fries” served with horseradish cream sauce. mmmm. Pam this looks so yummy. I want to make it for dinner! Just beautiful presenatation and photos. I have some sweet potatoes that need to be used….and some chicken. This just might make it into my oven this week. Thanks! I’m with Peter, this is a Canadian pleaser! Plus, double the carbs and lie down with a book? You are speaking my language! What a delicious meal. I’ve never made maple roasted chicken before – great idea! I know you looked sorry to not be able to share, while you were revelling in your delightful chicken. I agree that more sweet potatoes would be in order. This would make any Canadian happy. The recipe calls for 2 smallish sweet potatoes and that can vary a lot. And you said to double that amount. About how many cups would you estimate double the amount would be?